MADE OF DURABLE LEXAN, RUGGED AND ATTRACTIVE. COMES WITH TWO BLACK PURIFICATION ELEMENTS. 2 WILL TYPICALLY TREAT 1,000 GALLONS. SET OF 4 WILL TYPICALLY LAST FOR 1000 GALLONS OR SIX MONTHS WHICHEVER COMES FIRST. 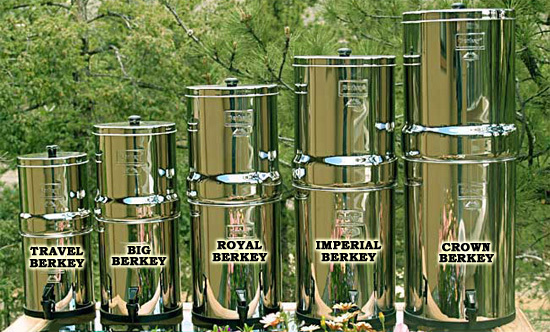 BLACK BERKEY PURIFUCATION ELEMENTS ARE MORE POWERFUL THAN ANY OTHER GRAVITY FILTER ELEMENT CURRENTLY AVAILABLE AND FIT MOST GRAVITY FILTERS, DRAMATICALLY IMPROVING THEIR ABILITY TO REMOVE UNWANTED CONTAMINANTS. THE KDF SHOWER FILTER REDUCES UP TO 95% OF CLORINE, REDUCES CHEMICAL ABSORBTION AND VAPOR INHALATION, REDUCES 98% OF WATER SOLUBLE HEAVY METALS AND CONTAINS BACTERIOSTATIC MEDIA (KDF-55) WHICH REDUCES DAMAGE TO HAIR AND SKIN AND ELIMINATES FOUL TASTES AND ODORS. THIS SHOWER FILTER WILL TYPICALLY LAST 10,000 GALLONS OR ONE YEAR. MANUFACTURED ONLY BY MEDICAL CORPS. POTASSIUM IODATE WILL SHIELD (OR BLOCK) THE THYROID AND PREVENT IT FROM ABSORBING RADIOACTIVE IODINE DURING A NUCLEAR EMERGENCY. EACH FACTORY SEALED BOTTLE CONTAINS 200 FRESH TABLETS OF POTASSIUM IODATE 85 mg.